"Minding Your Mind" at Cranbury School! Jordan Burnham shares his personal story of courage and hope with our seventh and eighth grade student audience. 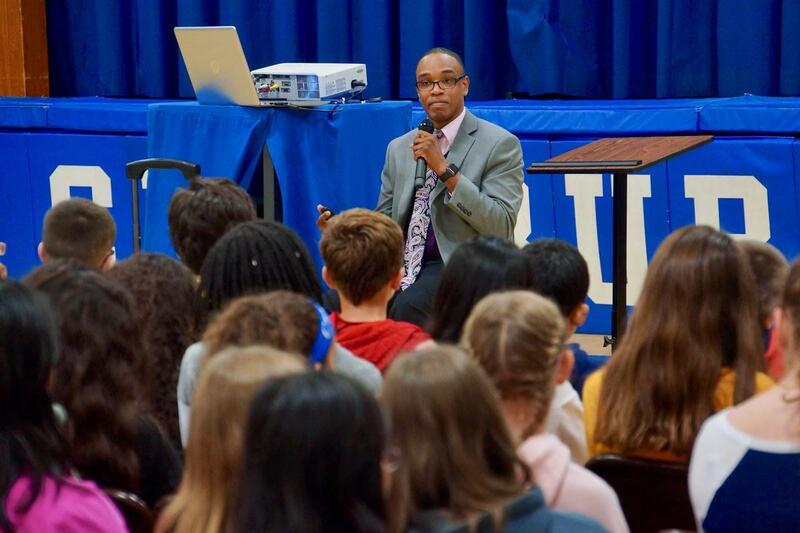 The primary objective of the Minding Your Mind Organization is to provide mental health education to adolescents, teens and young adults, their parents, teachers and school administrators. Their goal is to reduce the stigma and destructive behaviors often associated with mental health issues. Treatment is available, yet only 3 out of 10 individuals needing help actually seek help. Minding Your Mind Programs move away from crisis based response to prevention through education (Source: Excerpt from Minding Your Mind Mission Statement). Jordan Burnham is a professional public speaker from the Minding Your Mind Speakers Bureau. Jordan has received numerous accolades for his work in mental health advocacy over the last 10 years. He has been featured in Sports Illustrated, PEOPLE Magazine, and USA Today. He has also appeared on Dr. Phil, The Early Show, CNN, Good Morning America, and ESPN's E:60. His piece, "Unbreakable" with E:60 was nominated for an Emmy Award. Most recently, Jordan was interviewed by Anderson Cooper for the CNN special, "Finding Hope: Battling America's Suicide Crisis." In 2008, Jordan addressed a Congressional briefing on Capitol Hill and in 2013, he was invited to the White House for the National Conference on Mental Health, hosted by President Obama and Vice President Biden. Jordan spoke with seventh and eighth grade students on Monday, October 15th. He also delivered a powerful prevention message to our staff at our faculty meeting, and shared his story at a parent/community information session later the same evening. Susan L. Genco, Ed. D.